Imagine a jigsaw puzzle where 90% of the pieces survive, but there are 120,000 of them – and most the same colour. This, as Jason Wood and B Nilgün Öz discovered, is what confronts the archaeologists at Ephesus restoring the marble panels in the home of one of the city’s wealthiest and most influential residents. The residential neighbourhood once occupied by the great and the good of Ephesus sits adjacent to the magnificent Library of Celsus. It comprises two insulae built into the steep hillside in the centre of the city. First excavated between 1960 and 1985 by the then director of excavations, Hermann Vetters, the houses in the larger insula, known as Terrace House 2, are especially striking – and are in an excellent state of preservation. Today, the entire insula, about 4,000m2 in area, is shielded by a huge cover building (see CWA 1). This ingeniously lets in a high degree of light, but just 5% of heat to permeate the protective membrane. The structure allows visitors to watch the work being carried out on the remains by the multi-national team of archaeologists – led by the Austrian Archaeological Institute (ÖAI) – in relative comfort. Like almost all the surviving ruins, the terrace houses date mainly to the 1st and 2nd centuries AD. They were originally laid out in the Augustan period, replacing earlier Hellenistic constructions, but were brought to a premature end by the disastrous earthquake and subsequent fire of AD 262, during the reign of the emperor Gallienus. After the earthquake, the area lay uninhabited for several decades until, in late Antiquity, a few modest dwellings were built into the ruins. Despite this reoccupation, the remains of the houses survive very much as they were in the 3rd century. Terrace House 2 consists of six separate dwellings built over three terraces. The houses, one of which was later subdivided, were multi-storied and clearly intended for luxury and comfort. They were designed with a typical peristyle layout, with windowless rooms accessed and lit from the central open courtyard. All the houses had running water, with fountains either built into the courtyard wall or free-standing – the soothing sound no doubt creating a peaceful ambience. 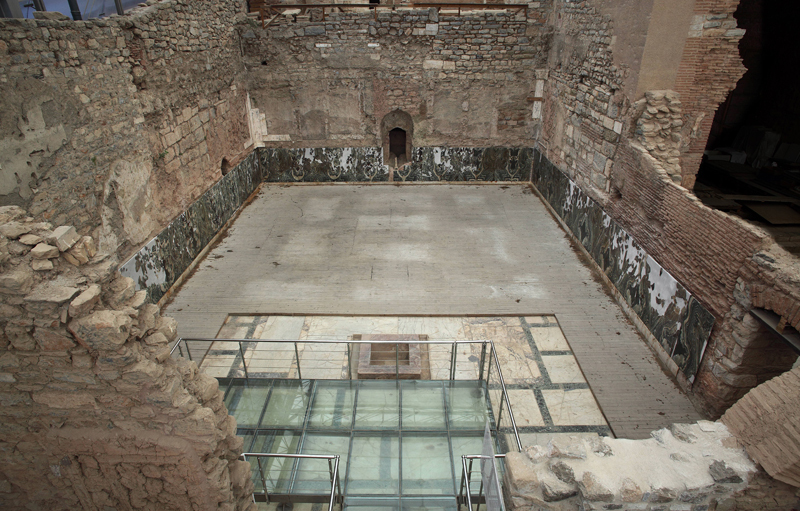 Under-floor heating was provided by hypocaust systems, similar to those used for the public baths, and many houses had their own well or cistern. The reception rooms were particularly richly decorated, and give a vivid picture of the luxurious lifestyle of prosperous Ephesians. There is extensive marble panelling, marble and mosaic floors, and many fine wall paintings – several of which feature graffiti, and drawings of gladiators, animals, and caricatures. Statues, portrait busts, and other domestic luxuries have also been recovered, many of which are now on display in the Ephesus Archaeological Museum in Selçuk. Work on this section of the site at Ephesus today is focused on the restoration of an impressive Marble all, which is in Dwelling 6. The spacious triclinium (dining room), 178m2 in area, formed part of the largest and grandest of the houses. We know it was occupied by the family of C Flavius Furius Aptus, a wealthy Ephesian who held municipal and priestly offices. The hall was decorated early in the reign of the emperor Hadrian: the rear face of a fragment of marble bears a quarry mark referring to Hadrian during his third consular year (AD 119). Another shows the name and date for the consulate of Cnaeus Arrius Augur (AD 121), thereby providing a secure terminus post quem. It would have been a sumptuous and impressive dining area, with two fountains – one on the south wall, the other at the opposite end of the room – and a carved, gilded wooden ceiling. 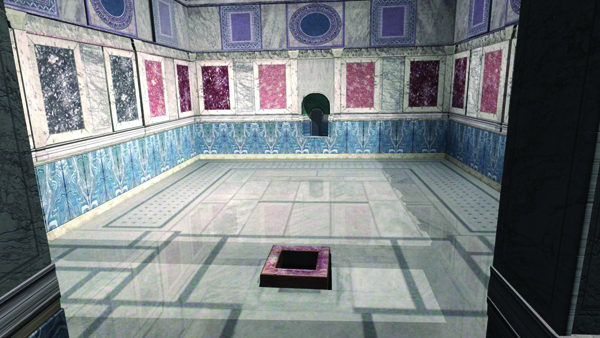 The floor was laid with marble plaques, into which was set a U-shaped mosaic band, where the klinai (couches) would have been positioned. The wall decoration consists of three zones of different marble panels. The lower zone, or socle, was made up of plaques of verde cipollino, a white and vivid green-black banded marble, cut from a single block and set up in mirror-image rows. Above this was a middle zone of pavonazzetto marble plaques framed by pilasters, while the upper zone contained emblemata with multicoloured decorative and figurative fields of opus sectile. It would appear that the hall was actually undergoing repairs at the time of the AD 262 earthquake: a number of plaques, clearly waiting to be reattached, were found stacked against a wall and sealed by the destruction layer. The plaques still show the marks where wall-fixings had been attached, and the remains of these dowels still protrude from the wall.